The aim of Coalition for Tobacco Control – Pakistan is to strengthen the development and implementation of policies based on the provisions of Framework Convention for Tobacco Control (FCTC) through advocacy campaigns and acting as a technical resource for the Ministry of Health. Coalition for Tobacco Control – Pakistan (CTC-Pak) has been advocating for stronger measures for tobacco control by the translation and adaptation of FCTC provisions into national tobacco control laws and was successful in convincing the signing and ratification of the FCTC by the Government of Pakistan. This led to promulgation of the national tobacco control laws which ban smoking at public places and public service vehicles, restrictions on the advertising campaigns of the tobacco industry and bigger and clearer health warnings on cigarette packs. Despite the introduction of these legislative measures, a comprehensive approach towards effective tobacco control is still lacking. These loopholes allow the tobacco industry to exploit an under regulated market. There is a strong need to keep the issue of tobacco control on the agenda of the policy-makers. The prevalence of smoking in youth as well as adult is high in Pakistan and the loopholes in the existing laws provide an environment for the industry to exploit especially in areas where implementation of the law is not strong and the consumption of tobacco is high. The strength of CTC-Pak is its membership who is already engaged in tobacco control work. The partners of CTC-Pak bring a range of expertise to the coalition and together present a unified front which is dedicated to the control of tobacco consumption in Pakistan. CTC-Pak requires support and commitment from civil society organizations for effective advocacy campaigns for raising awareness among masses on the issue of tobacco control by building their capacity and knowledge base on the tobacco control issue. 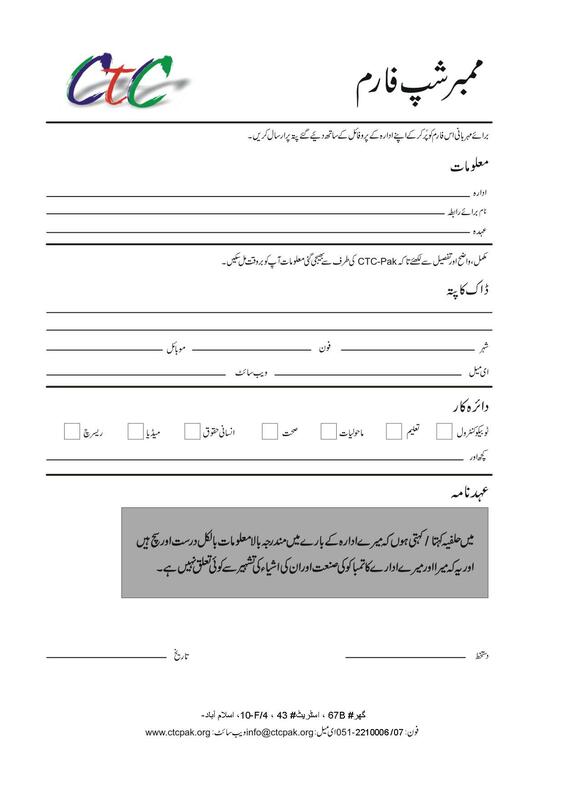 To become a member of CTC-Pak, download the membership form, fill the information and send it to the address mentioned in the form. CTC-Pak is recognized at government level as it acts as a technical resource to the Federal Ministry of Health and with international organizations such as World Health Organization (WHO) and The UNION. CTC-Pak is partner with TheNetwork for Consumer Protection, in its campaign for packaging reforms and pictorial health warnings on cigarette’s packs, and with Ministry of Health, in its campaign for enhancing tobacco control in Pakistan. CTC-Pak is an active member of Framework Convention Alliance (FCA), Global Smoke Free Olympics Campaign, Stop-TB, Health and Development Network and Bloomberg Grants Initiative Forum-Pakistan, and also partner of American Cancer Society and Health Bridge.